When King Altador has an urgent message that he needs delivered, His Highness always sends a member of the fittest and fastest Petpet species in the kingdom - the Yooyu. As a Yooyu, dodge obstacles and Minitheuses while collecting Altador goodie bags to get King Altador's message to its destination! 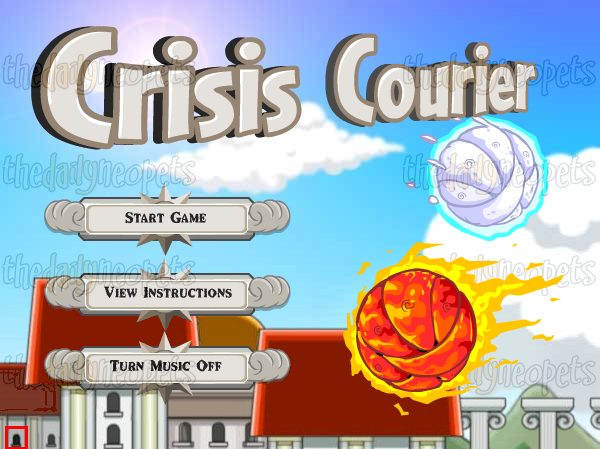 The purpose of this game is to avoid obstacles while attacking Minitheuses and collecting goodie bags. Use your mouse to steer the Yooyu and click the left mouse button to switch between the snow Yooyu and the fire Yooyu, depending on what enemies you are facing. 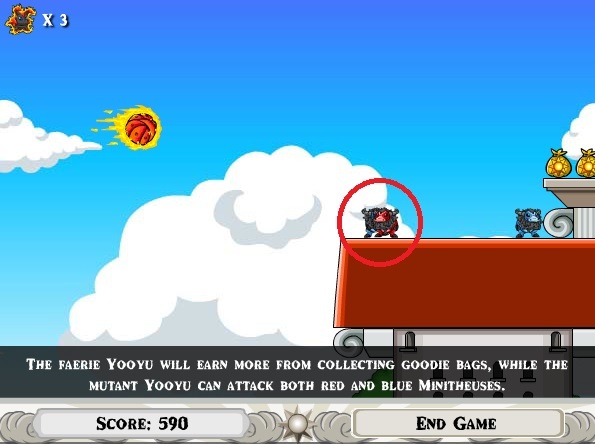 The fire Yooyu can only attack the red Minitheuses and must avoid the blue ones, whereas the snow Yooyu can only attach blue Minitheuses and must avoid the red ones. If you attack a Minitheus with the wrong color of Yooyu, you will lose a life. But if you attack a Minitheus of the correct color, you will earn 10 points. There are also Altador goodie bags scattered about the game for you to collect. They come in three different colors: red, blue, and gold. Gold can be collected by any Yooyu, while the red and blue ones can only be collected by a Yooyu of the same color. Goodie bags award you 5 points when they are collected. There are two power-ups in the game: winged fruits and figs. The winged fruits will temporarily turn the Yooyu into a Faerie Yooyu, which will collect 20 points from each goodie bag instead of the usual 5, but cannot attack any Minitheuses. The fig will transform the Yooyu into a Mutant Yooyu, which can attack any Minitheus but must avoid any red or blue goodie bags. Fire Yooyu One of your original Yooyus. Snow Yooyu One of your original Yooyus. Faerie Yooyu Transform into this Yooyu by collecting a flying fruit. Get extra points for every goodie bag you collect, but you cannot hit any Minitheuses. Mutant Yooyu Transform into this Yooyu by collecting a fig. Can attack both colors of Minitheuses, but cannot collect red or blue goodie bags. Red Minitheus Can only be attacked by a Fire or Mutant Yooyu, worth 10 points. Blue Minitheus Can only be attacked by a Snow or Mutant Yooyu, worth 10 points. Gold Goodie Bag Worth 5 points normally and 20 points when collected by a Faerie Yooyu. Red Goodie Bag Worth 10 points when collected by a Yooyu of the correct color and 20 points when collected by a Faerie Yooyu. Cannot be collected by an opposite-colored Yooyu. Flying Fruit Turns you temporarily into a Faerie Yooyu when collected. Fig Turns you temporarily into a Mutant Yooyu when collected. Have good equipment. Crisis Courier is a mouse-avoider game, so a good mouse and mouse pad is imperative. 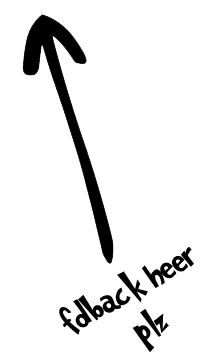 If your mouse is sometimes unresponsive or doesn't move smoothly, that can severely hurt your game. Prioritize staying alive. Try to attack all the Minitheuses and collect all the goodie bags you can, but don't do it if you'll lose a life. You can collect more points later, but if you run out of lives - game over! Attack the Minitheuses. If you have a choice between a goodie bag or a Minitheus, unless you have the Faerie Yooyu power-up, the Minitheus is worth 5 more points. Just make sure you're using the correct color of Yooyu! You might want to stay away from bunches of differently-colored Minitheuses in order to preserve your lives. These grouped Minitheuses would end your Yooyu's life, but in this case the Minitheuses are traveling in different directions, so you might be able to let the separate and use some quick clicking to successfully attack them both. Use the power-ups wisely. 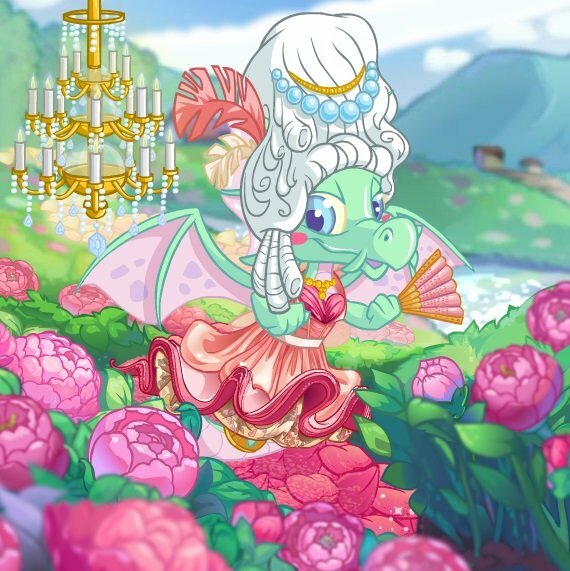 The Faerie Yooyu will quadruple your point earnings from goodie bags, plus you don't have to worry about what color the bags are. The Mutant Yooyu means you can't go wrong attacking Minitheuses, and it's especially useful when you have a group of differently-colored Minitheuses all bunched together. Just be careful: there are some power-ups placed so that it is actually not beneficial to pick them up, such as a Flying Fruit placed right before a big group of Minitheuses. Try to look ahead to see if you should pick it up, and when in doubt, skip the power up. You can always learn from any mistake. Practice, practice, practice. The levels are the same every time, so keep playing until you know what's coming. If you know what's coming up next, you can know whether it's a good idea to pick up that Flying Fruit or not. Getting a trophy in Crisis Courier mostly takes practice. Trophy scores often start at around 12,000 - 14,000 points on the first of the month. To get there, you want to make sure you score high in early levels. Try to get to at least 590 points in Level 1, 2300 points in Level 2, and 5000 or more points in Level 3. Type kingaltador to gain an extra life (one use per game). The secret level doesn't really have a point. All it has is walls in the shape of the words "Weepit was here." Who knows what that means! All in all, even if you aren't very good at this game, you can still get a good amount of Neopoints and it is quite fun too!